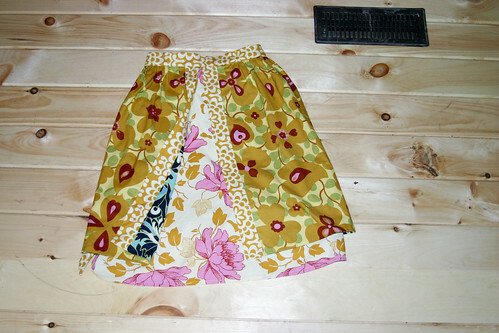 Lori Danelle: maker of things: Skirt. . .finally done. 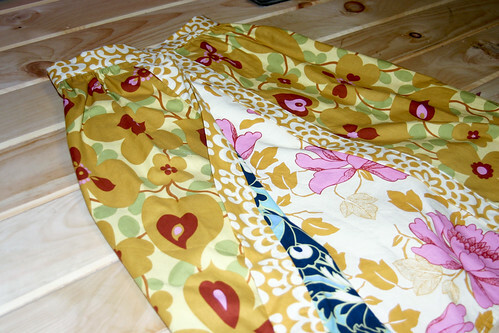 So you may remember that I claimed that I was sewing a skirt and showed off the fabric and such a few months ago. Well, I did sew the actual skirt, but there's an apron overlay that tripped me up a bit. I didn't read closely enough and the pattern was to make a reversible apron. I needed more fabric!! But I couldn't decide. Then I found it. Ordered it and got it delivered a few weeks ago. You might have caught a glimpse here. Michele, just wait, they're not done yet!!! Oh so cute! I almost bought this pattern at Textile the other day...I got the Socialite dress pattern instead. I have never made a dress for myself. We'll see if it turns out well enough (and in time) for a wedding we're attending in Sept.. Great job on the skirt!! Socialite dress is Anna Marie Horner, right? (I think I saw her at Target today!!!) Let me know how it turns out. . .I've been eyeing it as well! !